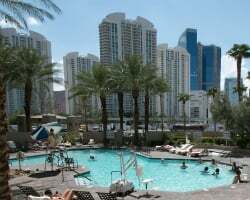 Discover the sights and sounds of Las Vegas up-close-and-personal with the timeshare suites at Hilton Grand Vacations Club on Paradise. Browse resales and rentals priced up to 70% lower than retail. Located not far from the thrill of the Las Vegas Strip, the Hilton Grand Vacations Club on Paradise offers impeccable convenience and proximity to the city's best attractions. 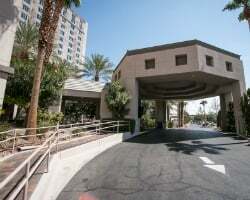 Known colloquially as the Las Vegas Hilton Convention Center, this resort is just steps away from the venue, where hundreds of events are held each year. Featuring on-site amenities like a heated outdoor pool, a fitness center, a deli, and so much more, the Hilton Grand Vacations Las Vegas Paradise will offer a complete vacation experience. Accommodations at the resort consist of studio units as well as one and two bedroom suites that incorporate modern furnishings with convenient features to provide a relaxing stay. Perfect for couples as well as families, the luxurious timeshare suites at the Paradise include highly desirable amenities like fully equipped kitchens, a washer and dryer, a jetted spa-style bathtub, and unbeatable views of Sin City. With larger units spanning more than one thousand square feet, your entire party will have enough space to feel comfortable from your first night in Vegas until your last. Are you ready to call Las Vegas your home-away-from-home? Fill out the form on this page to learn more, or call a representative at 1-877-815-4227 today. Purchasing a timeshare at the Hilton Grand Vacations Club on Paradise can provide you with years of great trips to Las Vegas filled with amazing benefits and perks. However, buying that timeshare on the resale market can give you all that for thousands less, allowing you to save big and vacation even bigger. Resales are sold by current timeshare owners instead of by the resort itself, meaning prices for the same ownership accommodations are much lower. You can save up to 70% on timeshare accommodations by purchasing on the resale market, offering you the deal of a lifetime. Resales at the resort are typically available in the form of deeded fixed and floating weeks spread throughout Hilton's Gold and Platinum seasons. 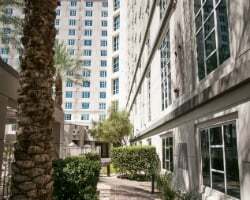 You can also find ownership options at the Hilton Grand Vacations Las Vegas Convention Center in the form of HGVC points, offering a more flexible option. With the ability to narrow available units by size, price, and features, you can find your dream accommodations instantly on the resale market. The Paradise is affiliated with the Hilton Grand Vacations Club. As one of the most popular timeshare brands in the industry, you'll have instant access to some of the club's best benefits with your timeshare resale. While you won't be able to join the club at the Elite level, you'll still be able to maximize your vacations with exclusive perks and privileges. For example, you can use HGVC points to better manage your Hilton reservations and bank or borrow points to plan easy vacations. You can also convert any unused points into HHonors rewards, which you can apply toward stays at Hilton hotels. Finally, the biggest benefit of them all is the opportunity to see dozens of thrilling destinations by vacationing at other Hilton Grand Vacations Club resorts around the globe. Your timeshare resale at the Hilton Grand Vacations Club on Paradise could also be your ticket around the globe. The resort is affiliated with RCI, the world's largest timeshare exchange company. Exchanging your timeshare resale can lead to vacations at popular resorts in different worldwide destinations, allowing you to truly maximize your vacation ownership. Simply deposit your Las Vegas accommodations into the exchange network and trade for stays at resorts in Orlando, Hawaii, New York, and beyond. The Paradise is also a Gold Crown rated resort, meaning you'll be able to exchange for reservations at resorts of comparable quality. You can also trade your timeshare week for RCI points and explore cruises, weekend getaways, travel discounts, and more. Sin City is yours with the ultra-luxurious HGVC on Paradise. 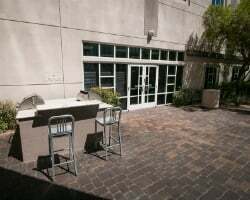 You'll find a variety of fantastic on-site amenities like a heated outdoor swimming pool, a game room with a pool table, and a full-service fitness center. Stop by the on-property convenience store for last minute needs, or make dinner reservations and find things to do through the concierge. Lunch is made easy through the Paradise Garden Deli, which serves up sandwiches and ready-to-cook food items. The area surrounding the resort will fill your days with wonderous things to do and see. Head to The Strip, just a half-mile away, to prowl all the familiar locales. Gamble the night away at the Bellagio, the Venetian, or the Wynn Las Vegas. Catch a live show from incredibly popular acts like Cirque du Soleil at one of the stunning entertainment venues, or ride sky-high thrill rides at the Stratosphere. Venture outside the city for great day trip potential at Red Rock Canyon or even the Hoover Dam. Already Own at Hilton Grand Vacations Club on Paradise?